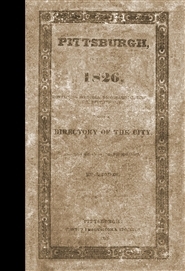 (2016) Reprint of The Pittsburgh Directory for 1819, Allegheny County, Pennsylvania, originally published by J. M. Riddle and M. M. Murray. 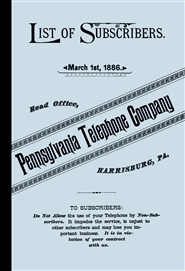 The directory contains "the names, professions, and residence of all the heads of families, and persons in business in the city of Pittsburgh and its suburbs." 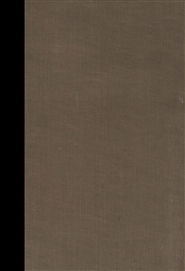 (2016) Reprint of the directory "Pittsburgh in the Year 1826", originally published by S. Jones. 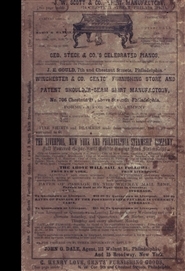 The publication contains "sketches topographical, historical and statistical; together with a directory of the city, and a view of its various manufactures, population, improvements, etc." 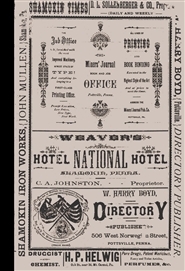 (2016) Reprint of the "Pittsburgh Business Directory for the Year 1837", originally published by Isaac Harris. 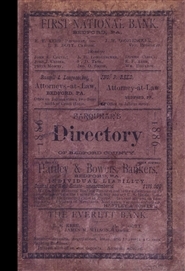 The publication contains listings of Pittsburgh, Alleghney, Birmingham, Lawrenceville, McKeesport, Sharpsburgh, Smithfield and condensed business listings of Beaver, Bedford, Bellefonte, Bellevernon, Blairsville, Brookville, Brownsville, Butler, Canonsburg, Carlisle, Chambersburg, Ebensburg, Erie, Franklin, Freedom, Greensburg, Hollidaysburg, Huntingdon, Indiana, Johnstown, Kittanning, Lewistown, McKeesport, Monongahela City, New Brighton, New Castle, Perryopolis, Sharon, Washington, Waynesburg, and others. 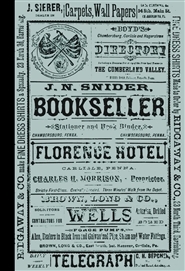 (2016) Reprint of Boyd's Directory of Shamokin and Sunbury, Northumberland County, PA for the year 1884-85. The directory lists residents as well as businesses within the cities, providing the resident (or business) name, occupation, and street address for each. Also included are business listings for other nearby towns: Milton, Mt. Carmel, Northumberland, and Watsontown. 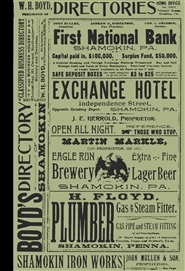 (2016) Reprint of Boyd's 1891-93 Directory of Shamokin, Pennsylvania. 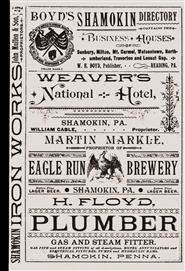 This is a resident and business directory of the city of Shamokin, Northumberland County, PA for the year 1891-93. Directory information includes the resident (or business) name, occupation, and street address for each listing. 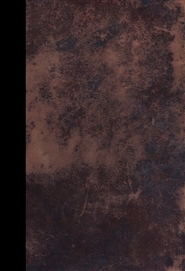 Concludes with classified business directories for Locust Gap, Mt. Carmel, Northumberland, Sunbury and Trevorton.